Cut pink, blue and green paper into 5-inch x 6-inch rectangles. Cover pink paper with glue stick and wrap around one of the tubes. Repeat this step with the blue and green papers on the remaining two tubes. Cut 3 strips of black paper, each measuring 1-inch x 6-inch. Glue each black strip around the center of each tube. Print the provided pattern onto white paper. Cut out the leg pieces and use a black crayon or marker to color in the shoes. Use glue stick to attach the legs to the inside of each tube. Cut out the Powerpuff Girls heads and arms. Glue the arms to the sides of the tubes. Glue the girls' heads to the appropriate tubes. HINT: the color of their eyes match their dresses! 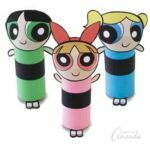 This project for Cardboard Tube Powerpuff Girls was printed from CraftsbyAmanda.com - https://craftsbyamanda.com/cardboard-tube-powerpuff-girls/ and can only be printed for education or personal use.